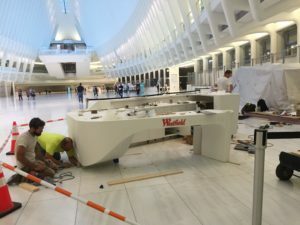 Today, solid surface materials are becoming utilized for more design applications than just countertops. 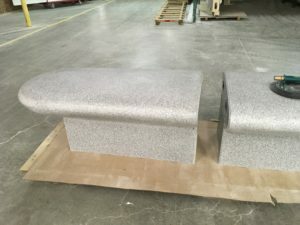 New innovative core materials starting to find their place in solid surface fabrication. 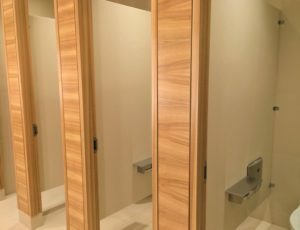 Design professionals are also fueling these changes with new applications such as doors with CNC routed designs to 1” thick solid surface toilet partitions. As design professionals explore these design applications for solid surface, technical challenges can arise. For example, solid surface panels for toilet partitions need to be lightweight but strong. Standard toilet partition hardware can’t handle the weight of a 1” thick solid surface acrylic partition. Additionally, cost implications of utilizing solid partitions can be difficult for any owner to accept. ASST has a wealth of experience with arriving at innovative solutions for unique projects. For one corporate client, ASST proposed a fabrication solution for toilet partitions that preserved the design intent while satisfying owner concerns for performance. Honeycomb plastic core sheets are available in a variety of thicknesses. Most solid surface manufacturers now have sheet materials in thinner thicknesses from 1/4” to as thin as 1/8”. By creating a “sandwich” of 1/4” solid surface each side of a 1/2” thick core, the weight is drastically reduced. Standard partition hardware can now be utilized and any additional blocking or accommodation for toilet accessories can be made by the fabricator. Doing what ever it takes to solve a problem and Going Beyond for our customers is of prime importance. Our innovative team of estimators, planners and project managers collaborate and deliver project results in a way few competitors can. Safety on the job affects everyone, from the smaller subcontractor to the General Contractor in charge. According to OSHA, nearly 6.5 million people work at approximately 252,000 construction sites across the United States on any given day. General Contractors need subcontractors who take safety seriously and actively promote accident prevention through accredited in-house OSHA safety training. Injury rates, for the construction industry, continue to climb higher than the national average in this category for all industries. The causes of death in construction were: falls, struck by object, caught-in/between, and electrocution. These “Fatal Four” were responsible for nearly three out of five (59%) worker deaths. To address this problem Insurance companies increased their rates to cover this added risk. Businesses can be fined, sued or banned from operating. If a serious enough infraction occurs, the accident could halt progress on the site which could lead to loss of the contract or worse. At ASST we believe in taking a proactive educational approach when it comes to safety. We have found that holding monthly safety meetings, led by our OSHA certified Safety Manager, is one of the best ways to reinforce safety compliance. Training is also offered for forklift certifications, machine operational procedures such as “Lockout/Tag-out”, and those employees requiring any other additional certifications for specific projects. A wide variety of additional Instructional safety videos are available 24/7 on ASST’s YouTube channel for viewing by employees via their phone or tablet devices. The risks to construction worker health requires safety planning to help minimize, address and hopefully prevent construction related accidents before they occur. ASST is uniquely positioned to fulfill all aspects of your project. Whatever you need, ASST can build it to the exact specifications you require in a safe manner and to the finest quality standards you expect. We are Going Beyond to address your exciting project challenges. Contact us now online or call us at 717-630-1251.